As If Theatre Company (AITC), newly created by local theatre artists, Cindy Giese French, Amy Gentry, and Molly Hall, has scheduled their first show at the historic Kenmore Community Club February 8-24, 2019. 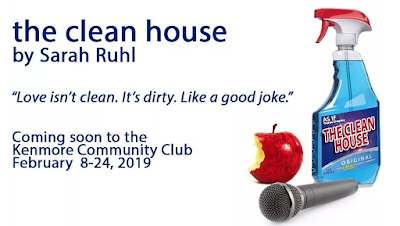 Sarah Ruhl’s award-winning play, The Clean House, will be the debut production for AITC and the company is thrilled to announce the cast lead by director Carissa Meisner Smit. The ensemble cast features Devika Bhagwat, Terry Boyd, Cindy Giese French, Amy Gentry, and Carolynne Wilcox. ASL performance Friday, Feb 22. To reserve ASL seating, contact admin@asiftheatre.com after purchasing tickets. Tickets on sale now at BrownPaperTickets and later at the door.